DRAMeXchange , a division of TrendForce , points out that the drop in DRAM contract prices continues to grow in the first quarter due to the overabundance in inventory levels, falling by over 20% in overall ASP. The accelerating drop in prices did not stimulate a recovery in demand, and transactions have still been few. DRAM ASP is predicted to continue falling well into the third quarter as inventories clearouts have yet to be completed. According to research by DRAMeXchange, inventory levels accumulated by DRAM suppliers (including wafer banks) have generally come to over 6-weeks’ worth at the end of the first season. Although inventory levels may vary among buyers due to different product categories, they stand at up to 5 weeks on average at the very least. Server and PC customers even possess inventory levels over 7 weeks’ worth. Supply bit will continue to grow as the second season begins, thanks to contributions from the 1Ynm process. With an aim to greatly reduce inventory levels, DRAM suppliers in general will continue to adopt large price-lowerings in order to stimulate sales. Prices drops will be greatest in PCs and server DRAMs just like the first season, coming to a decline of 20%, while mobile DRAMs will drop by a smaller 10~15% due to the pull created by customers as they buy new phones. DRAM ASP is predicted to continue descending by 20% in the second season. As for whether price drops may successfully shrink in the second half of this year, it depends on demand recovery and the extent to which inventories clear out in the second quarter. 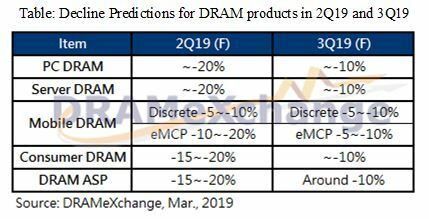 A DRAMeXchange analysis predicts that end demand recovery will be the key factor determining whether DRAM sales hit rock bottom, since average DRAM content-per-box in 2019 will perform worse than last year across all product categories. But simply judging from the supply-demand prediction that oversupply will be far less serious in 2H than in 1H, price drops may be expected to undergo gradual contractions in the third and fourth seasons. Looking at the price trends of various DRAM applications for this year, commodity DRAMs and server DRAMs exhibit the most salient drops since the fourth quarter last year due to higher inventory levels. PC demand was quite sluggish in the first half-year owing to the lack of shipment growth and the yet-to-be-alleviated Intel CPU shortage in mid-range and low-end devices. Mainstream 8GB commodity DRAM module solutions, for example, have fallen by 30% in price in the first quarter, with the bottom price lying around 40 USD. ASP will proceed to move towards 35 USD in the second season looking forward, and may even hit the 30 USD threshold by year-end. After going through a two-year streak of high demand, server stock ups are starting to show significant signs of failure thanks to the rather high inventory levels in 1Q and the arrival of the traditional offseason for OEMs. Though a few North American datacenters have begun to place orders in March, the number of overall purchases has yet to see a clear revival. Furthermore, current inventory levels are high on both the supply and demand ends, and server DRAM prices are predicted keep on falling until inventory clears and demand recovers. DRAMeXchange predicts that declines will remain around 20% in the second season, and persist into the third and fourth season at around 10%. For mobile DRAMs, total smartphone production has fallen by over 10% compared to last year in response to an unenthusiastic market. As a result, mobile DRAMs suppliers cannot effectively clear their inventories, causing prices to see new depths. Discrete and eMCP products have dropped by about 20% on average, resulting in no small commotion in market quotes. Contract prices are predicted to shrink compared to the first season, not only due to the increase in content-per-box initiated by the Android / iPhone duo, who are procuring parts for their new flagship devices, but also the transition from offseason to peak season, which will revitalize demand. However, considering that total smartphone production quantity will show negative growth this year, and the limited content-per-box growth in mid- range and low-end phones,contract prices still face an inevitable fall in the second and third season. Lastly, we look at specialty DRAM price trends. A few set-top boxes and internet connectivity tenders have popped up in China after the lunar year holidays, pulling production ever so slightly. But after this one-time tender event, overall demand slumped nevertheless . As DDR3 supply remains higher than demand, this year’s specialty DRAM prices are predicted to keep falling by 15% and 10% in 2Q and 3Q respectively.